I decided to join in with the final sew along for this season of Project Run & Play. Each season, the final week is "My signature style". 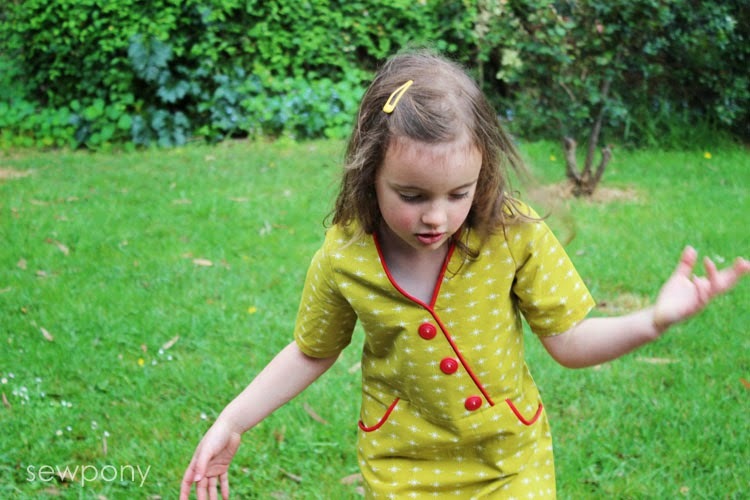 I thought it was the perfect opportunity to finish and show you this version of my new pattern - Sunday picnic dress, which I made Isabella. Since Juliette received the last three versions (here, here and here), Isabella asked if she could have one too....um, okay!! 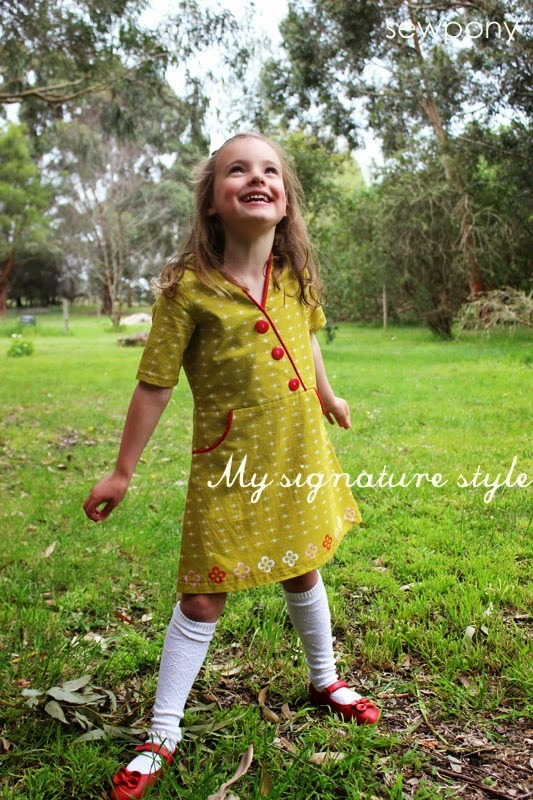 So what is 'my signature style'? I love vintage inspired designs and also fabrics. I love florals, spots, piping, buttons, sweet little collars, interesting details on garments and clothes that are easy to get on and off! 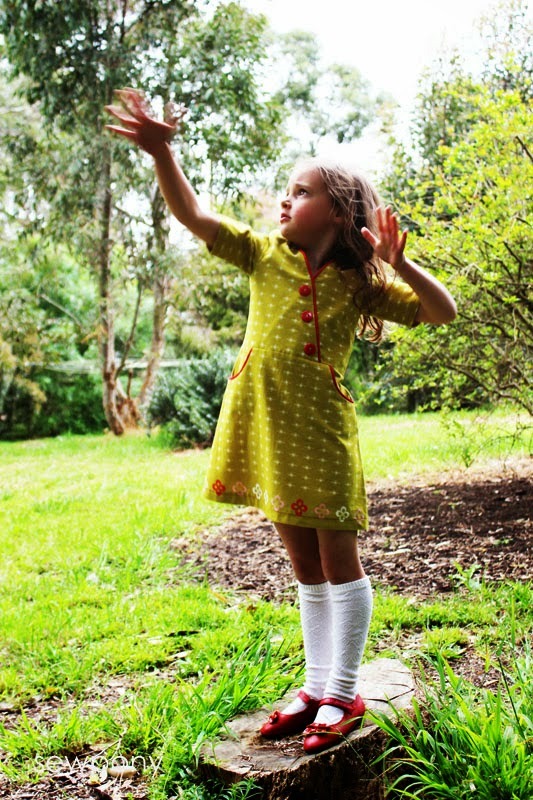 So I had to pair this dress with some knee high knitted socks (from the op shop) and some red mary janes for cuteness. How cool is the border on this print? I love that I could incorporate it onto the hemline of the dress. Isabella was in a bit of a silly mood when I took these photos, so there are a few random poses, like the one above! 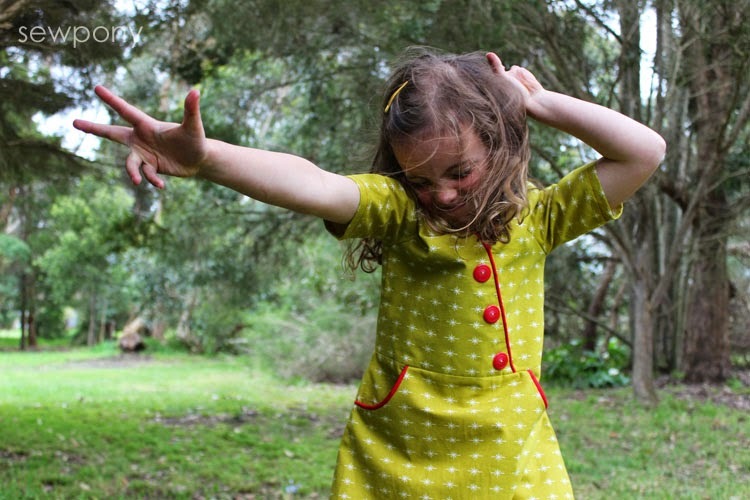 The fabric is Cotton and Steel Mustang - Star (in Mustard) by Melody Miller. I particularly love the note on the selvage of this fabric: "Leap and the net shall appear". Man I love ALL the fabrics in the Cotton and Steel collection and have a few more half made into garments to show soon. I purchased the fabric from Frances at Miss Matatabi (my new favourite online fabric shop - great shipping costs to Australia compared to the US). The photo below has been edited with high contrast but I kind of like it so have included it too! This is my favorite one yet! I LOVE it! Border prints are so much fun! I love the details on this dress AND that it looks like it's easy-on--my 4 year old and I are BOTH ready for her to be able to dress herself more often! that version is super beautiful! i love me some mustard yellow ;) and the poses of your girl are simply amazing! My favourite too so far! 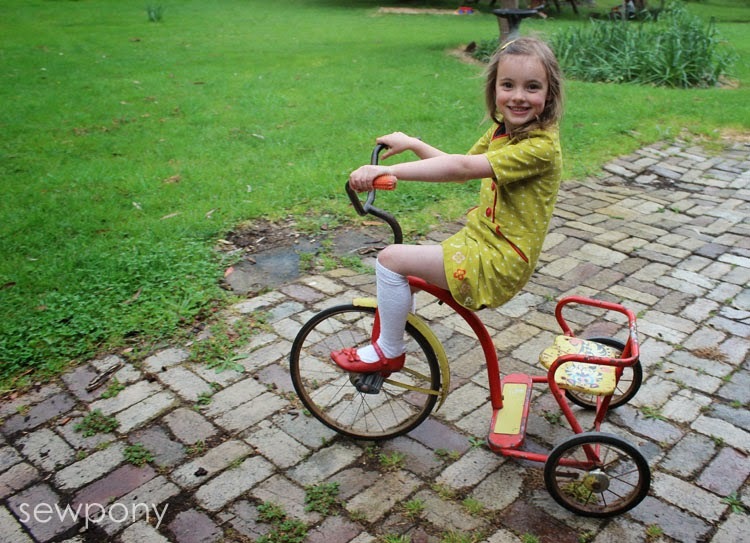 Love the red and yellow combination, and the shoes....I've got my Sunday picnic dress all cut out and ready to go. And it's so totally different from this one. Isn't it fascinating how one pattern can create so many different looks? Think this is why my sewing pile never ever gets any smaller! Thank you! It is quite a job keeping our grass under control! such a lovely dress! the whole outfit is beautiful! I like the vintage feel to it, the details, the crossover... She looks adorable in it! Beautiful dress. 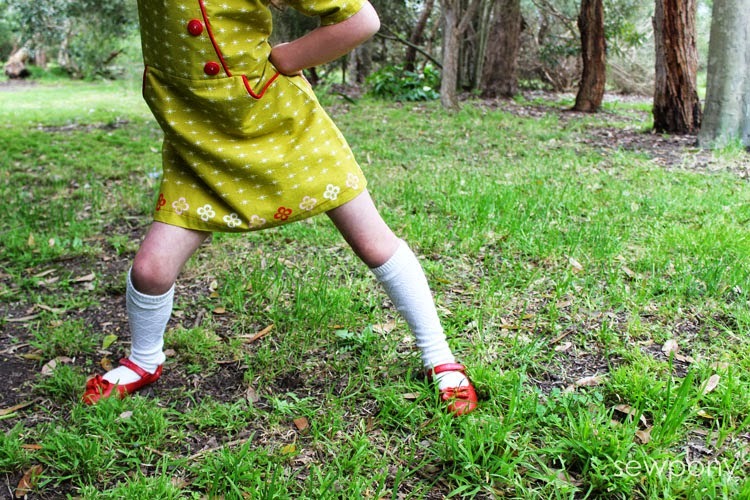 You certainly have succeeded in giving it a vintage feel, especially with the knee high socks and red shoes. Wow, Suz, this is amazing! This is one of the most amazing dresses I have seen in a long time! It is perfection! Thank you everyone!! Great minds An!!! I love the dress! And your kiddo has some serious personality :) Great job! So so cute! LOVE the fabric and the pop of red! Adorable dress and the photo shoot looks like a lot fun. Well Done!